Use this interactive home search to view current MLS listings of homes for sale in the Vista Point subdivision. 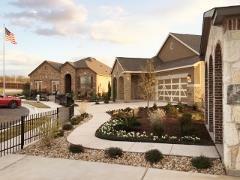 If you find a home that interests you or want a NO Pressure tour of homes in Vista Point, call Jim at 512.913.1557. 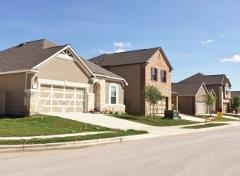 Neighborhood Location: The Vista Point Community is located east of IH-35 in Southeast Austin. Take exit #228 (William Cannon Dr.) off IH-35, then go east from IH-35. In about 3 miles you will see the sign at the entrance to the neighborhood. Turn right at Janes Ranch Rd. into Vista Point. 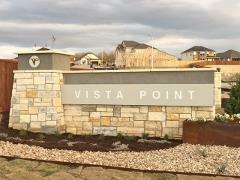 Scroll down to see more info on Vista Point. The data below is designed to give you a history of home sales, sizes and ages over the preceding year (data to be added yearly) in the Vista Point subdivision. Note: KB Home sales are largely in-house, and few of the community sales show up in the MLS data. Vista Point Southeast Austin real estate market data from Austin Board of Realtors, 1/1/2015 to 12/31/2018. This subdivision is a project of KB Home. Begun in 2015, the work in February 2018 is progressing well. 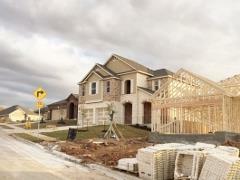 The builder is offering 17 different home plans in Vista Point. These have base prices beginning at $248k and going up to $311k (February 2018). Of these models, there are 8 single-story homes available (1,582-2,655 sq. ft. of living space, and 9 two-level plans (2,183 sq. ft. to 3,475 sq. ft.). These homes in Vista Point come with KB Homes limited 10-year warranty and many standard features that enhance their livability both inside and out. These features include full sod and landscaping, and an energy star rating (with double-pane windows, 14.5 SEER HVAC, Wi-Fi thermostat, radiant barrier roof sheathing, etc). Interior features include Whirlpool appliances, Moen faucets, garbage disposal, 4 TV or phone outets, and more! Buyers have a lot of options available to personalize their homes at an early stage in the construction process. 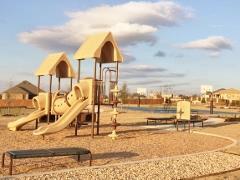 The Vista Point neighborhood provides a play area with playground equipment (swings, slides, e.g. ), basketball court and more. These are for the use of homeowners and their guests. Other nearby "things to do" and "places to go" include Southpark Meadows (at IH-35 South and W. Slaughter Ln.). Southpark Meadows a "go-to" shopping and eating venue that features large-box stores like a Super WalMart, Target, Sam's and Best Buy, along with eateries, banks, a movie theater, several furniture stores, small businesses, and more. There are other places nearby at the intersections of IH-35 and William Cannon/Stassney, south of Austin in Buda (Cabela's) and Kyle, and in areas toward Austin. Those who love to golf have several area options, like the Plum Creek Golf Club, and the City of Austin's Grey Rock, Clay and Kizer golf courses. There are two multi-featured park facilities close by: the McKinney Falls State Park (Texas Parks and Wildlife) and the Mary Moore Searight Metro Park just off W. Slaughter Ln. (City of Austin owned). Travel to the airport (ABIA) via McKinney Falls Parkway is fairly easy, as is getting to Downtown Austin and other locations via IH-35. Owners of homes in Vista Point must be active members of the neighborhood HOA (Vista Point HOA, managed by Colby Property Management). Taxes in Vista Point are assessed by these primary entities: City of Austin, Travis County, and Del Valle ISD, along with two others. The total tax rate, which varies from year to year, was set at around $2.482/$100 of property value for the year 2017. Students living in the Vista Point community attend schools of the Del Valle School District. Potential Vista Point homeowners should confirm the current schools with the Del Valle ISD.